Let's be honest, its just over a 2 hr drive away. No wonder we keep finding ourselves in Edmonton for a fete. I.V. 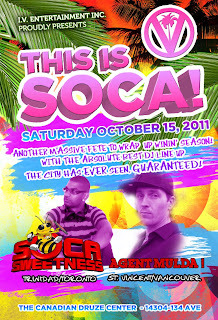 Entertainment brings the heat again on Saturday October 15th 2011 with DJs Soca Sweetness from T.O and Agent Mulda from Vancouver. Both DJs held court for the official Cariwest Afterparty in August and this one is reason enough for us to take a drive again. DON’T STICK! Arrange your tix NOW!